IRON MAIDEN singer Bruce Dickinson was a recent guest on the "Nyhetsmorgon" program on Sweden's TV4 channel. You can now watch the chat below. 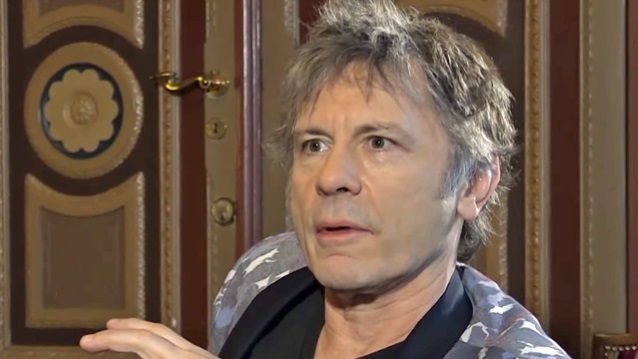 Asked what the "biggest highlights" have been of his years with IRON MAIDEN, Dickinson said: "Wow! The biggest highlights of my years with the band… The first album I did with them, 'The Number Of The Beast' album, because it started this big snowball that kept getting bigger and bigger and bigger, [playing the] Rock In Rio [festival in Brazil], the biggest thing we did in the '80s. I'm not sure I'd describe it as a highlight, but leaving [the band], because that meant that I could come back, and that was a highlight for me — coming back was a highlight. And, actually, now, about to go on tour again with them, because we toured last year — very successful. Because every year that I can go out and play is a highlight. For me, the highlight of my year is going on tour." When questioned about whether he feels he is as good as an artist now as he was before, Dickinson said: "I think we're playing, as a band, better than we were in the '80s, and the evidence is there — you can hear it in the live recordings and things. As an artist, you learn so much more about your craft, if you like — just your stage craft. And also the things you can do with your voice. So you do learn a lot more about things like that." Dickinson's autobiography, "What Does This Button Do? ", last month landed at No. 10 on the New York Times "Hardcover Nonfiction" best sellers list. It was released in the U.S. on October 31 via Dey Street Books (formerly It Books), an imprint of HarperCollins Publishers. Following the massively successful global tour of 2016-17 in support of its 16th studio album, "The Book Of Souls", IRON MAIDEN will take to the road again in 2018 with a series of arena and festival shows in Europe on the "Legacy Of The Beast" world tour, opening in Tallinn, Estonia on May 26 and finishing at the O2 Arena, London on August 10.